Villa Baan Waan has a special aspect down a lush coconut covered valley towards the ocean, marine park and sunset. Villa Baan Waan is light and airy, with a large private pool and 3 bedrooms. The villa ranges over several floors and is large enough to provide private space for a family or couples traveling together. 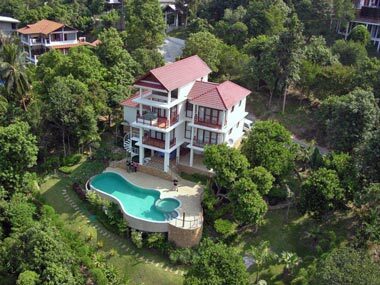 Villa Baan Waan has a large swimming pool and sun terrace set in a tropical garden with thai native trees and shrubs. The house is practically furnished with adequate facilities and amenities to make a comfortable holiday villa with plenty of character coming from the quiet natural residential area of the village. The villa is located in the private estate of Santi Thani which is accessed by private road and with management and nighttime security.